Costa Concordia Captain To Face Manslaughter Charges : The Two-Way Capt. Francesco Schettino is accused of negligence that led to the grounding of the ship and of abandoning the stricken vessel while a rescue of its more than 4,200 passengers and crew was still underway. 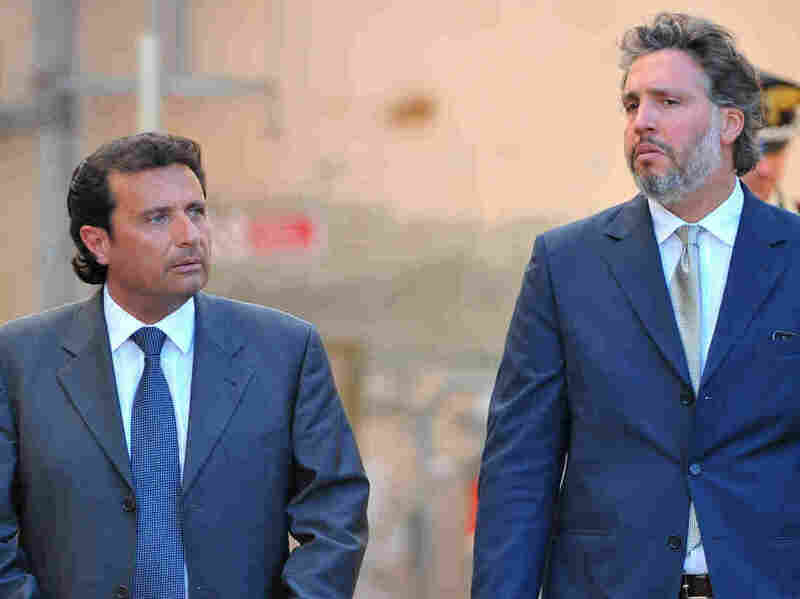 Francesco Schettino (left), the captain of the Costa Concordia, leaves court with his lawyer, Francesco Pepe, last month. A judge has ordered Schettino to stand trial in the wreck of the cruise ship last year. A judge in Italy on Wednesday ordered the captain of the ill-fated Costa Concordia cruise ship that ran aground off the coast of Tuscany last year, killing 32 people, to face charges of manslaughter. Francesco Schettino, 52, is accused of negligence that led to the grounding of the ship and for abandoning the vessel while a rescue of the 4,200 passengers and crew was still underway. Captain Schettino has said his superiors ordered him to get close to an island, Giglio, for sightseeing purposes. The ship hit a rock, which gashed its hull and caused the ship to start taking on water until it capsized just off the island. In April, Costa Cruises struck a plea bargain with prosecutors and agreed to pay $1.28 million for administrative offenses related to the charges against its employees." Since the incident, the nearly 1,000-foot-long cruise ship has been lying on its side at the site of the grounding just outside the island's main harbor.